I didn't know much about The Pride before I saw it. I had seen a Pillsbury House Theatre production at the Guthrie this summer (In the Red and Brown Water) and was impressed by the play and the theater's commitment to the community. I wanted to see something in their theater (at Chicago and 35th Street in Minneapolis), and I'd watch Tracey Maloney in anything, so I went to see The Pride. I was blown away. It's a great play with an important message, at times painful to watch, uniquely constructed in two different time periods, with brilliant acting by all four cast members. The two interconnected stories feature three characters in two time periods in London: 1958 and 2008. They're sort of the same characters (they have the same names in both time periods), but they're fundamentally different, maybe because of the culture they're living in. With each scene the action switches from one time period to the other. Even though the set doesn't change (except for the opening and closing of doors on a bookcase), it's obvious which time period we're in by the clothing and the way the actors carry themselves. It's amazing to watch these actors create two such distinct and fully realized characters (not to mention the super quick costume changes). Even their accents and way of speaking are different between the two time periods. There's a delightful array of British accents, like watching a great show on BBCA. Our three main characters are two gay men and a woman, and the triangle takes different forms in the two time periods due to the social norms of the time. In 1958, Sylvia (Tracey Maloney) is married to Philip (Matt Guidry), but something is off in their marriage. They seem happy on the surface, but Sylvia is desperate to have a child because she's afraid of being alone with Philip for the rest of their lives. She introduces her husband to her co-worker Oliver (Clarence Wethern), suspecting, but also dreading, that they might have something in common. They feel an instant attraction to each other, which Philip unsuccessfully tries to ignore. They have a brief but intense affair until Philip ends it, in what may be the most realistically and painfully violent scene I've ever seen on stage. It's a tragic exploration of what happens when people aren't allowed to live their own truth. Fast forward to 2008 when times are different. Philip and Oliver have been together for a year and a half, but Oliver repeatedly cheats on Philip, and Philip has finally left him. Sylvia is Oliver's best friend who introduced the two men. Oliver is miserable without Philip and wants him back, and Sylvia reluctantly helps him as they all prepare for London's Pride parade (hence the title). This story is more hopeful than the earlier one. In the second act the apartment set changes from Syliva and Phillip's 1958 flat and Oliver's 2008 home to Syliva's 2008 flat. On prominent display is one of those photo series that spell out a word with photos of things that resemble letters, and this one spells "HOPE." The play ends with 1958 Sylvia repeating Oliver's earlier words, that one day "it will be all right." We're not quite at the place of total equality and acceptance of all people, but as The Pride illustrates, 2008 is closer to it than 1958. It's an interesting juxtaposition between the two sets of characters. In 1958 Oliver is the one who is sure of and confident in who he is, while Philip is doing everything he can to deny it and live by the standards of the day. In 2008 Philip seems to have it all together, even a career that he loves instead of the job that the 1958 Philip is stuck in. Oliver is the one who doesn't know how to get what he wants, and is his own worst enemy. As I said before all of the actors do an amazing job creating their different-yet-similar characters. Clarence Wethern is particularly impressive in his portrayal of the strong but vulnerable 1958 Oliver, and the lovable rogue of 2008, whom you can't help but root for despite his frequent mistakes. In addition to the three main characters, three completely different secondary characters are played by Paul de Cordova, two of which are scene stealers. 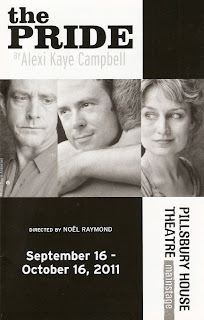 The Pride, directed by Co-Artistic Director Noël Raymond, runs through October 16 at the Pillsbury House Theatre. It's not an easy play to watch, but well worth the effort.